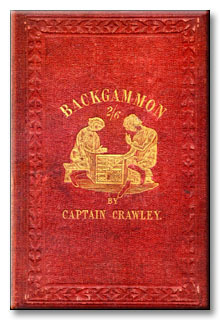 AUTHOR: "Captain Crawley" was a pseudonym used by George Frederick Pardon (1824-1882) for a series of books he wrote on billiards, backgammon, chess and draughts (checkers), and whist, loo, and cribbage. He took the name from a character in the novel Vanity Fair by William Makepeace Thackary, which was published as a monthly serial in 1847-48. Crawley is an all-around gamester and mentioned several times in connection with billiards, the subject of Pardon's first book. Comprising G. F. Pardon's complete work and many valuable parts of Andrew Anderson's "Checkers."